For the past fifty years, the Museum of Modern Art has been separating artists from their politics and in so doing sanitizing the history of Modern Art. �Communist Tour of MoMA� connects the history of Modern Art to history of the 20th century Communist movement. The project is based on research conducted at the Museum of Modern Art archives in New York, focusing on Modern artists from the MoMA collection whose careers overlapped with the trajectory of the Communist Party. Below are some highlights from the notes I took during his whirlwind talk in the permanent collection floors of the museum. C-Monster was also tweeting during the tour using the hashtag #commietour. We began with Picasso, in front of the painting above. 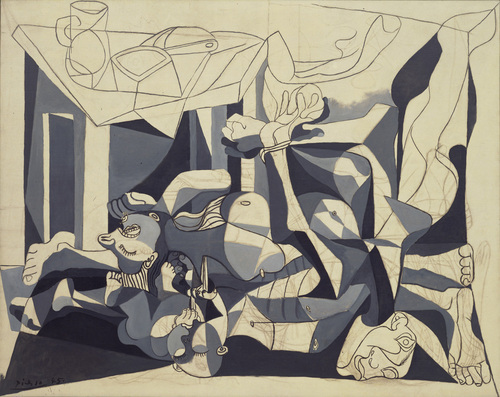 Picasso joined the French Communist Party in 1944. He thought of Charnel House as a political/war painting in the tradition of Goya. Over his lifetime he donated millions of francs to the party and participated actively through peace conferences as well as publications and petitions. He was refused a visa to visit the the United States in 1950 due to his communism. Picasso and Leger contributed drawings to a French brochure honoring the Rosenbergs after their execution. Mark Rothko was a member of several communist-backed organizations, including the American League Against War and Fascism and the American Artists� Congress. Like many others, he left the Congress, after the Molotov�Ribbentrop Pact/Molotov�Ribbentrop_Pact of 1939. Ad Reinhhardt contributed cartoons to communist publications such as "The New Masses" and "Soviet Russia Today" in the 1930s and 1940s. Some were published with his real name, some with a pseudonym, and some anonymously. David Smith was a member of the party from the late 1930s until the end of World War II, and joined at a time when one had to belong to a study group to learn about Marxism before being admitted. Jacob Lawrence taught at Camp Wo-Chi-Ca, was a cartoonist for "The New Masses," and signed a 1937 letter protesting against the potential banning of the Communist Party of the USA. While we were learning this, and standing near Lawrence's Migration Series (jointly owned by the Phillips Collection and MoMA), Yevgeniy was shocked to have a tourist come up and ask, "Are these primitives?" Of course we all know about Diego Rivera and Frida Kahlo's communism. The most interesting facts for them were: Rivera getting expelled from the Soviet Union during a 1927 visit for "anti-Soviet" politics, and Kahlo's remark that she was a better communist than Rivera was or ever would be. After her death, Kahlo's body lay in state at the Palacio de Bellas Artes in Mexico City covered with a red flag bearing the hammer and sickle. That seems like plenty for now even though there were many more, so I recommend talking to Yevgeniy at his #class presentation on March 12. Ask him about Matisse! Update: James now has a post with some photos of the tour.